T-Mobile today announced that it won out in a couple of new consumer surveys. 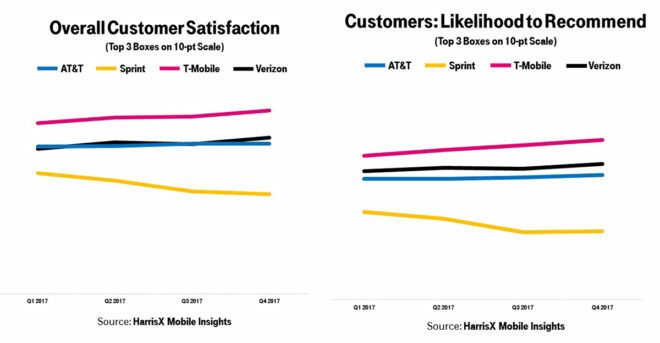 T-Mo reports that it came out number one in Overall Customer Satisfaction and Customers: Likelihood to Recommend in surveys conducted by research firm HarrisX. The firm surveys more than 360,000 consumers each year. The HarrisX results show T-Mobile on top in both categories throughout 2017. Verizon finished 2017 in second place in both categories, while AT&T came in third and Sprint finished fourth. Meanwhile, research firm YouGov BrandIndex reports that T-Mobile earned the highest consumer satisfaction scores throughout 2017. T-Mo customers scored their satisfaction at 70 out of 100 in Q1 2017, 66 in Q2, 69 in Q3, and 72 in Q4. To compare, the only other carrier to score a 60 or higher was Verizon, and that only happened in one quarter of 2017. 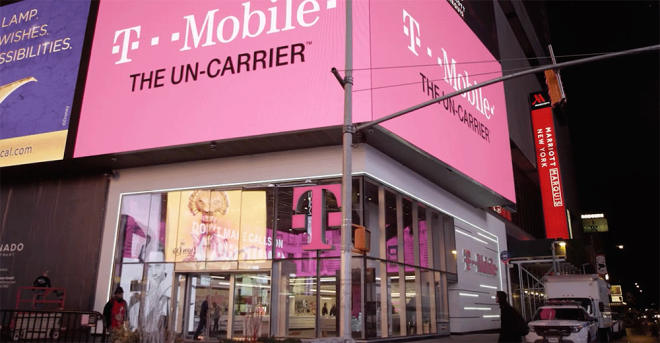 T-Mobile CEO John Legere regularly talks about how he and T-Mo listen to customers and solve their pain points, and according to these new reports, that strategy continues to work. How satisfied are you with T-Mobile as we begin 2018? I haven’t seen any posts recently about the 600mhz rollout. . . They just shared info today on that. Look for it on John’s Facebook Page. I saw, thanks! Just thought something would have been posted about it in December cause T-Mobile said west Texas will be covered by the end of the year. 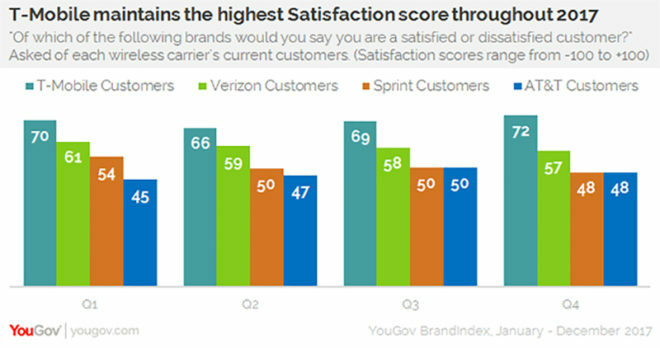 Sprint is the only carrier trending downward on both of the top two charts. No surprises there. It’s statistically irrelevant and you ignored the 4 point drop from Verizon (Sprint was down 6). If you had read my post properly, you would have understood that I was only referring to the HarrisX charts, not the YouGov one.